If you try to achieve a photo realistic look it`s important to understand some aspects related to photography. And considering the fact that we use photographic elements as a base in our artwork the following tips can also help you find the perfect stock images for your artworks. I have tried to illustrate these aspects using both photographs and photo manipulations. Having a sharp background is not a bad thing, especially if you have a beautiful background behind your subject but it`s good to know that there are other options too. This is an aspect that relates to landscapes and helps you create depth in your image. Because of the gases in our atmosphere the far away objects have less contrast and a slightly blue colour like the sky (or orange if it`s close to the sunset). If you want to create a foggy day the image will have even less contrast. I am mentioning this aspect because I have seen photo manipulations where the light on different elements does not match. When searching for the right stock images you have to think what is the light source in your final image and make sure all of your elements have the light falling on them coming from the same direction. In this image for example I have tried to make it look like the giant book is lighting the scene. So the light on the girl, trees, roots, leaves, book on the ground looks like it`s coming from the same direction. One source of colour cast could be coming from reflected light. This one is a bit harder to see. When light hits an object part of that light is reflected back and hits the other objects around. It usually borrows some of the colour of the first object that it hits. In the example below, the light hits the grass and is reflected back on the object. The original colour of the object is cream but, because of all the grass around it, it has a slightly green colour. Also this photograph was taken in the shadow of a tree. Because the sunlight was filtered through the tree leaves, it borrowed some of the green colour from the leaves. And filtered light is another possible source of colour cast. Another more obvious source of colour cast is a coloured light source. For example a candle, a light bulb, moonlight or any other colourful light source you can think of. In this case you need to make sure that all the objects that will be hit by this light also borrow some of the colour of the light. In the first image of the example below there is one light source which is the sun. In the second image I have added a second blue light on the subject and this light will also add a blue cast to other parts of the image, for example on the ground. I really hope some of you will find these tips useful and if you have any questions please feel free to comment below! 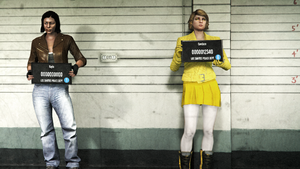 I've been experimenting with the character I once had you portray, making a GTA Online version. It doesn't...quite match your beauty (character on right), but I'm surprised I could get the character's outfit to look this close to canon.